AFA Coil #1a [1919 7+3 øre VERTICAL] Used Average pair with the scarce PEARL GRAY 3 øre. Neatly canceled. 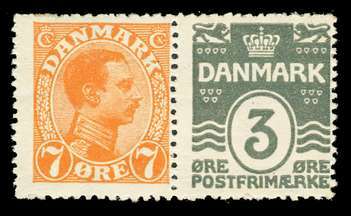 The 3 øre Pearl Gray stamp alone would sell for about $100 with this centering; it is rare to see an example of either the single stamp or the pair with such a low price. AFA Coil #25 [1919 7+3 øre HORIZONTAL] Mint Fine pair. Nice quality for this issue (usually poorly centered). AFA Coil #4 [1919 7+3+7 øre VERTICAL] NH Fine-Average 3-strip in very fresh condition. This is the Dark Gray color, which despite much lower catalog value, is actually much scarcer (in coil form) than the scarce Pearl Gray. AFA 2017 value DKK 700 = $105. AFA Coil #13 [1921 20 øre Christian X + 5 øre Wavy-Line, both Brown] Mint VF pair. Attractive. AFA Coil #13 [1921 20 øre Christian X + 5 øre Wavy-Line, both Brown] Mint Fine pair. Sheet join margin at top on backside (unusual). 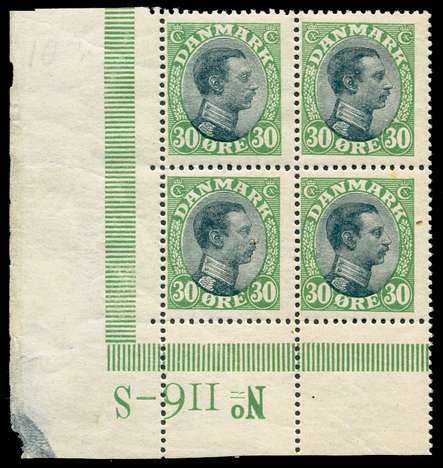 111, Facit #145, AFA #103 [1918 30 øre green and black Christian X] NH Fine lower left plate block #116-S. Lower right stamp with tiny natural inclusion. 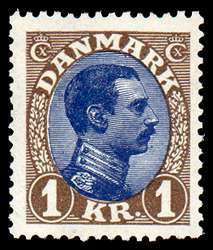 First printing of this bicolored stamp. AFA Specialized 2016 value is DKK 650 ($100) per each stamp and DKK 3200 ($480) for this plate number block. Few examples of these scarce early plate blocks are still exist intact. 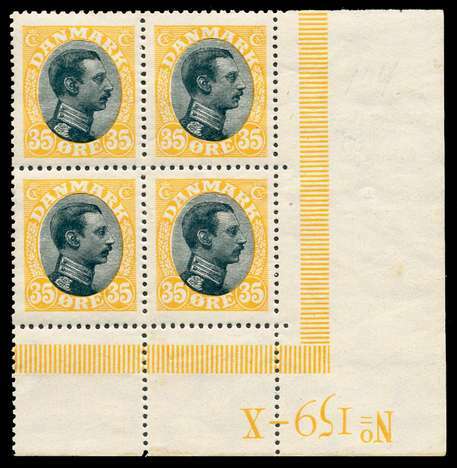 115, Facit #149, AFA #104 [1919 35 øre yellow and black Christian X] NH VF lower right plate block #159-X. This block very clearly shows that the three-sided perforation comb was one stamp high and open-ended at the bottom -- a feature not usually so obvious. AFA Specialized 2016 value is DKK 100 ($15) per each stamp and DKK 550 ($82) for this plate number block. An extremely attractive, premium quality example. Few examples of these scarce early plate blocks are still exist intact. 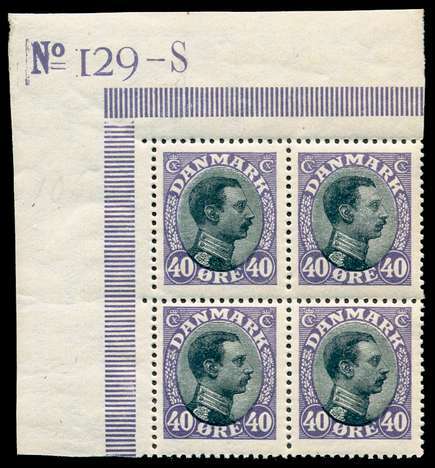 116, Facit #150a, AFA #105 [1918 40 øre lilac and black Christian X] NH VF/F-VF upper left plate block #129-S. This block very clearly shows that the three-sided perforation comb was one stamp high and open-ended at the bottom -- a feature not usually so obvious. AFA Specialized 2016 value is DKK 400 ($60) per each stamp and DKK 2200 ($330) for this plate number block. Very attractive. Few examples of these scarce early plate blocks are still exist intact. 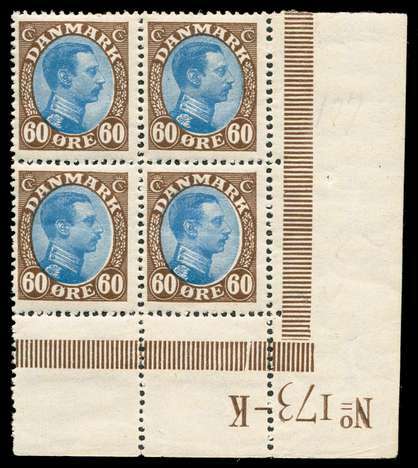 123, Facit #156a, AFA #107 [1919 60 øre brown and blue Christian X] NH F-VF lower right plate block #173-K. AFA Specialized 2016 value is DKK 1400 ($210) per each stamp and DKK 7500 ($1125) for this plate number block. Very attractive. Few examples of these scarce early plate blocks are still exist intact. This one is extremely scarce and is priced hardly more than the break-up value as NH singles. 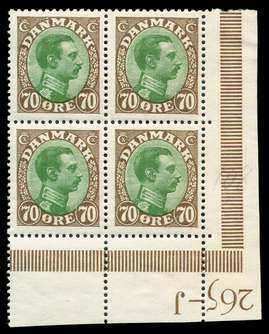 125, Facit #158, AFA #108 [1920 70 øre brown and green Christian X] NH F-VF+ lower right plate block #265-J. Margins narrowed and erased penciled number in margin. AFA Specialized 2016 value is DKK 550 ($82) per each stamp and DKK 2800 ($420) for this plate number block. Few examples of these scarce early plate blocks are still exist intact. Priced at only the break-up value of the four singles. 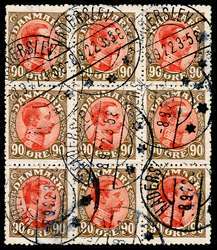 127 Used F-VF/VF 9-BLOCK with HADERSLEV 8 September 1922 postmarks. AFA 2009 Block Catalog value is DKK 225 = $38 for a simple 4-block; this is much, much scarcer than two four blocks! Very attractive. 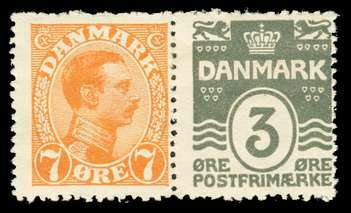 128 Type II [1 Kr Brown and Blue, Type II, 1927-33] NH F-VF+. Fresh and bright, excellent quality. 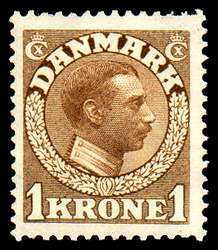 132 [1913 1 Kr Brown, Engraved] Mint VF, nearly Superb. Excellent example with unusually nice centering.